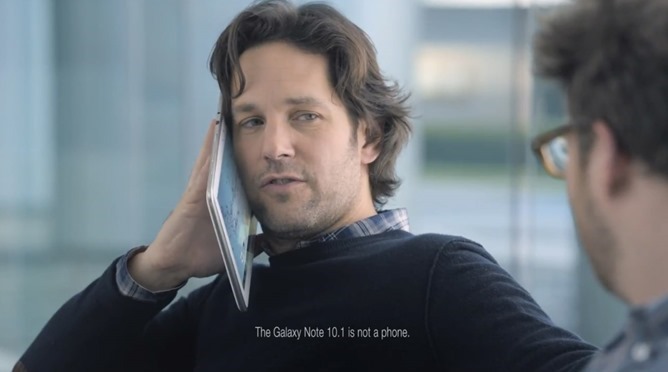 Reactions have been mixed to Samsung's somewhat understated Superbowl big game commercial, featuring comedy B-listers Seth Rogen and Paul Rudd. If you couldn't get enough of the pair trading jabs while pitching a meta Galaxy ad, Samsung has posted the full 4:40 cut to YouTube. The ad follows the plot and pacing of the shorter version, but there's a few extra punch lines in there. Just in case ninety seconds of middle-aged verbal jousting wasn't enough for you. 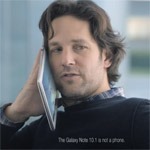 Samsung seems to be the only consumer electronics brand interested in the advertising world's biggest stage this year. Sadly, there's no reveal of new hardware headed for the US market or anywhere else. For that, you'll have to wait for Mobile World Congress at the earliest, where we kind of hope the guy playing the smarmy executive will deliver the keynote instead of Samsung's CEO. By the way, check 1:22 for some humorous tiny type.